Alex Verus has kinda become infamous since his battle for the fateweaver 5 months ago. It’s all hush-hush, so of course everyone knows. Alex is attempting to keep a low profile but when he discovers that someone is killing magical creatures, he has to investigate. Struggling to distinguish ally from enemy, he finds himself the target of those who would risk their own sanity for power. Guns, magic, and bombs. Oh my. This series makes me so happy, which is probably saying a lot about me. But I digress. As the last book, I really love this book. However, I take a small issue with Luna. Most of the plot in this book is based on her not being very smart and normally she is. It is understandable, because her curse makes her a very lonely character but I think her stupid choices were done so that she could fall into the Classic Female Stereotypes of damsel-in-distress at the end. Eh. I expected better. Clearly this doesn’t upset me that much because I am already reading book 3. 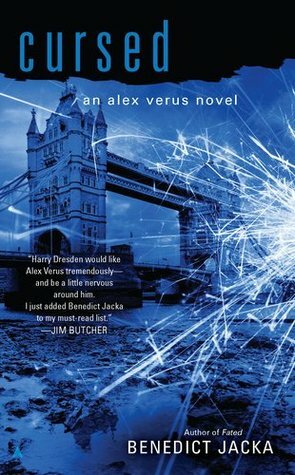 This entry was posted in Fantasy, Magic, Young Adult and tagged Alex Verus #2, Benedict Jacka, Cursed. Bookmark the permalink.